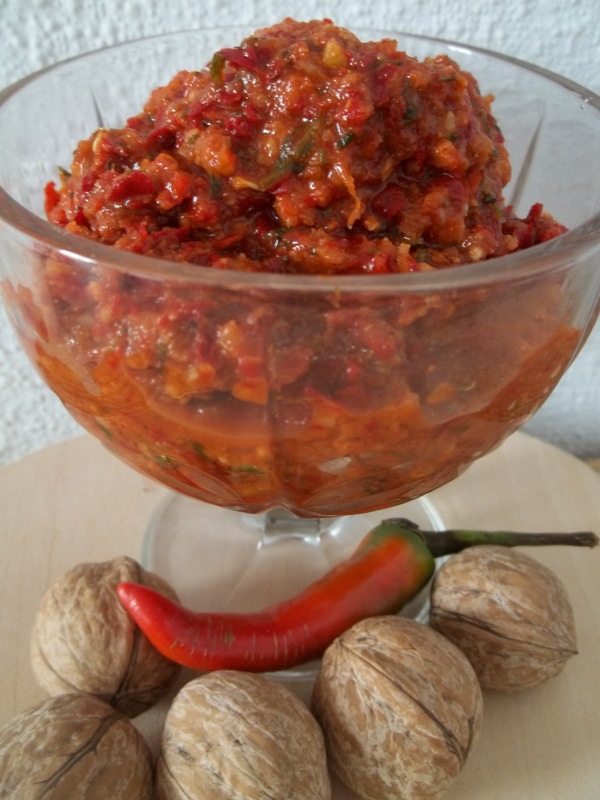 Ajika (Georgian: აჯიკა) is a hot, spicy paste used to flavor meat and fish dishes mainly in Samegrelo and Abkhazia. 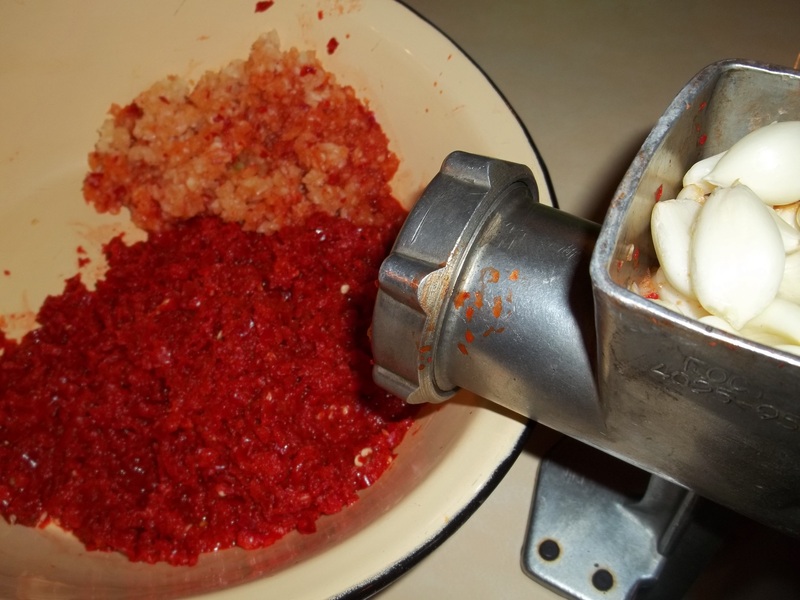 It is made with hot red peppers, garlic, herbs and spices. 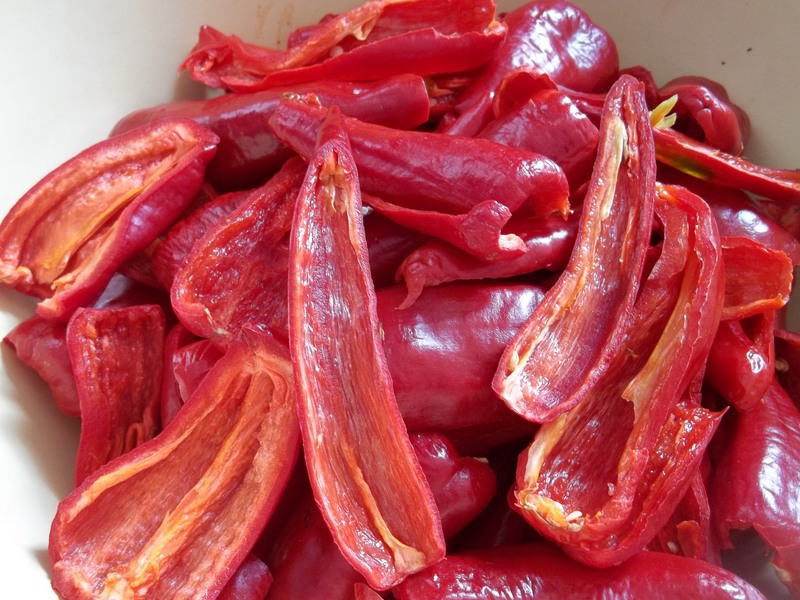 In appearance and consistency ajika resembles Italian red pesto. There are several types of ajika. 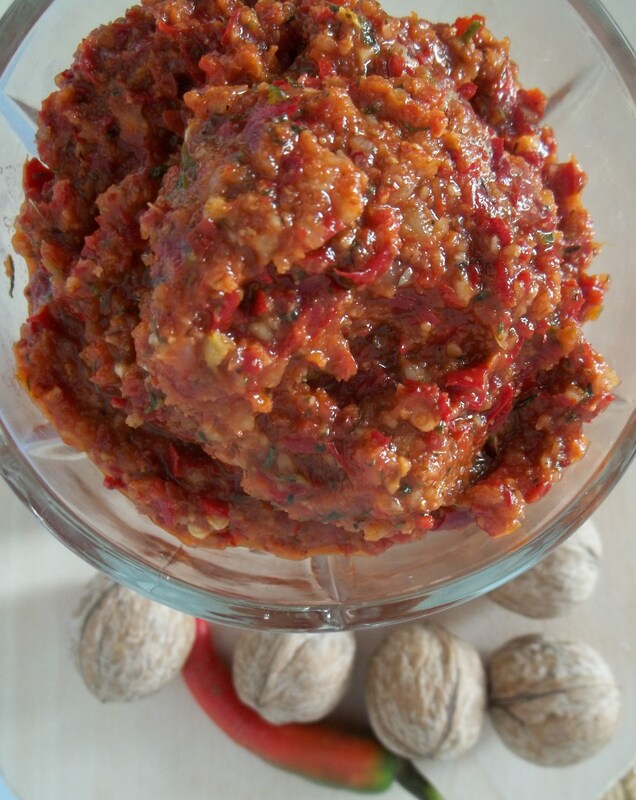 In this recipe we show how to make ajika with walnuts. This type of ajika is spicy and very hot! 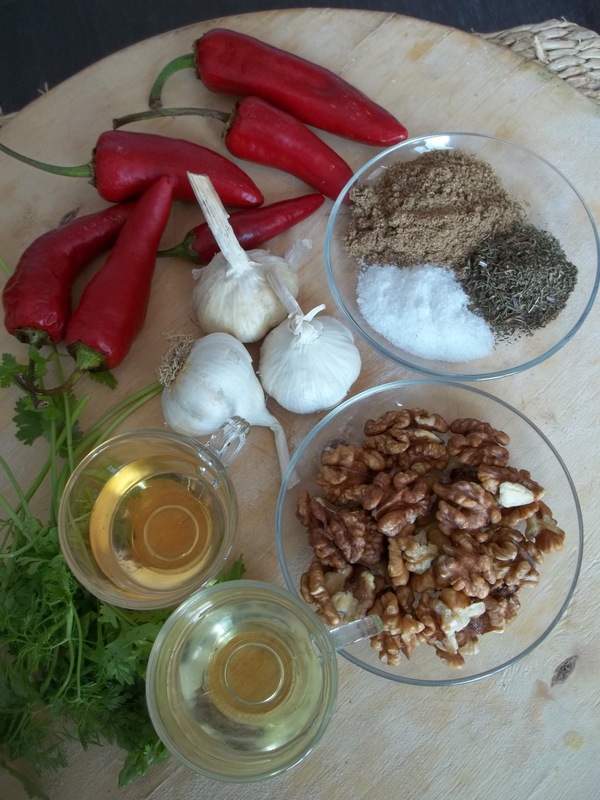 Ingredients: 1 kilo of hot red peppers, 400 grams of garlic, 300 grams of walnuts, 100 grams of fresh green coriander, 100 grams of dried coriander, 40 grams of dried Summer Savory, 50 ml of oil, 150 ml of white wine vinegar and salt (at least 50 grams). 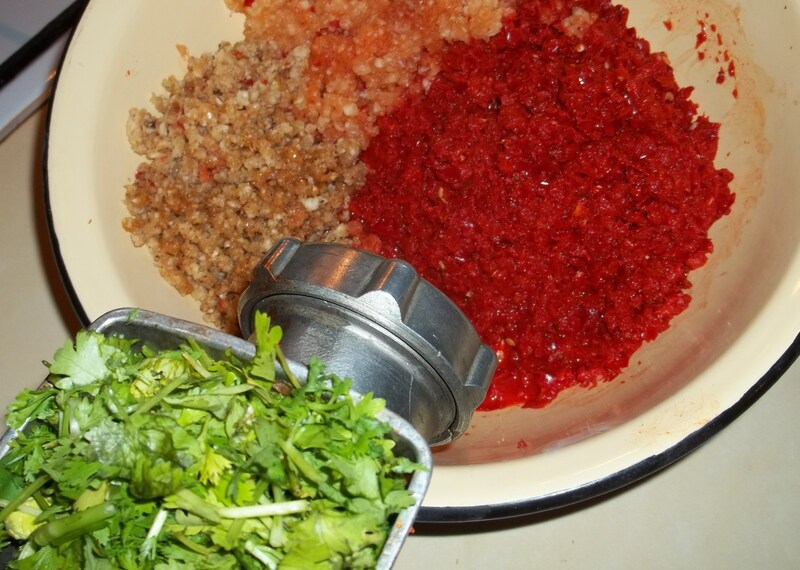 Preparation: Put the peppers and herbs onto newspaper and leave overnight to thoroughly dry. 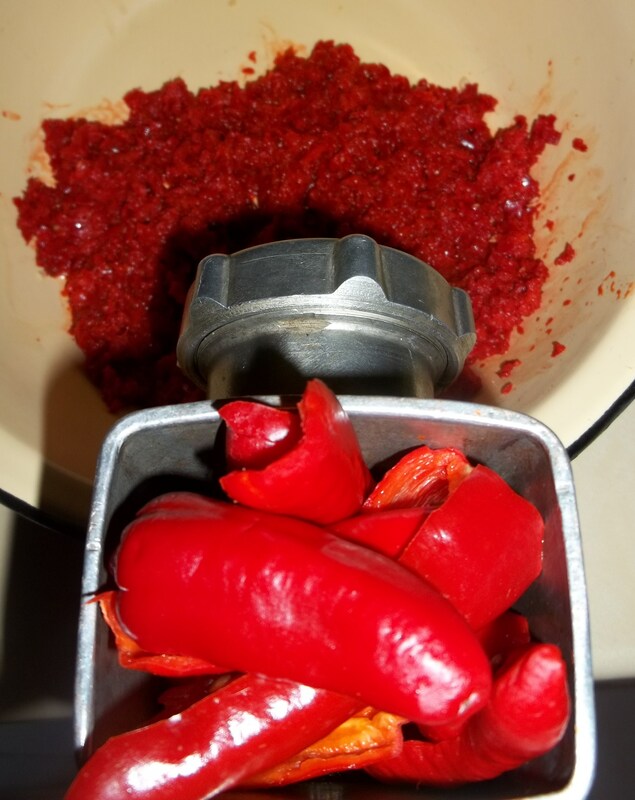 When ready to make the ajika, remove all of the seeds from the hot red peppers. 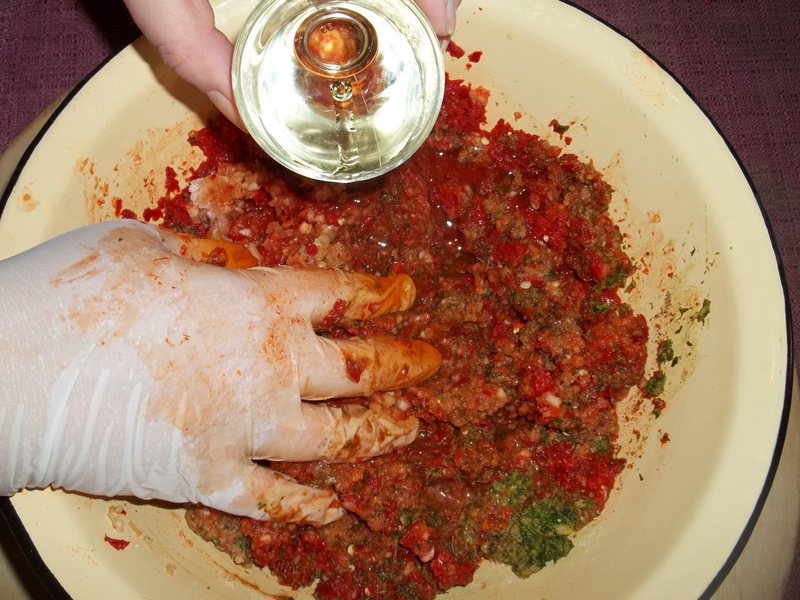 CAUTION: Wear gloves to do this or your fingers and hands will burn from the capsaicin (heat producing chemical) contained in the peppers. Save the seeds – dry them and use them in other recipes. 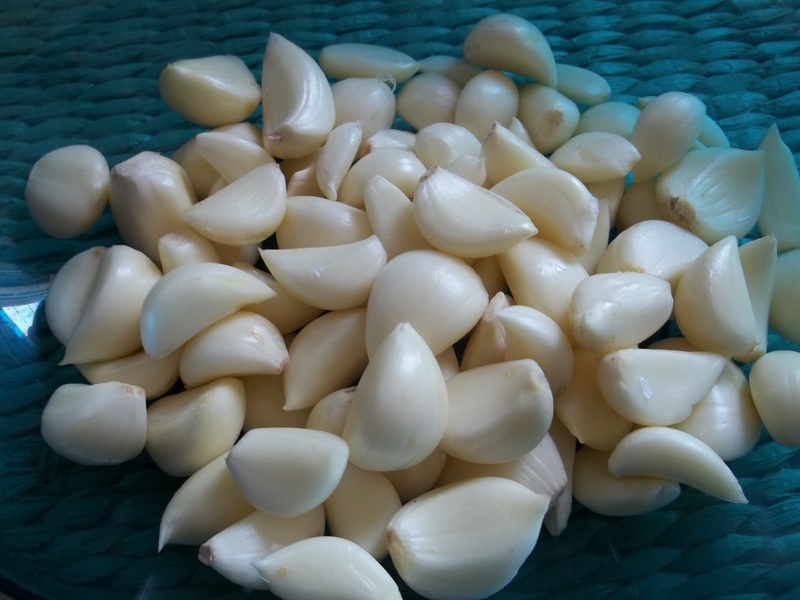 Remove the skins from the garlic. Crush the hot peppers. We used a meat grinder to do this. 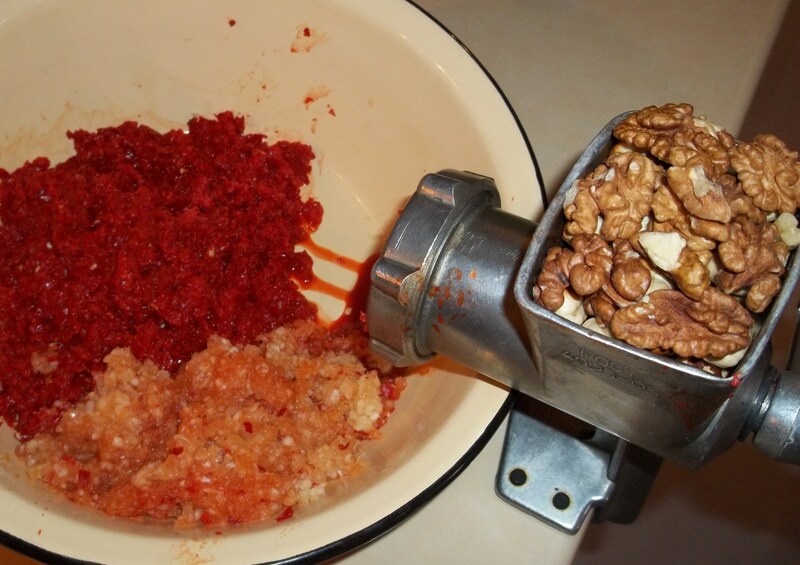 Remove the shells from the walnuts and crush them. 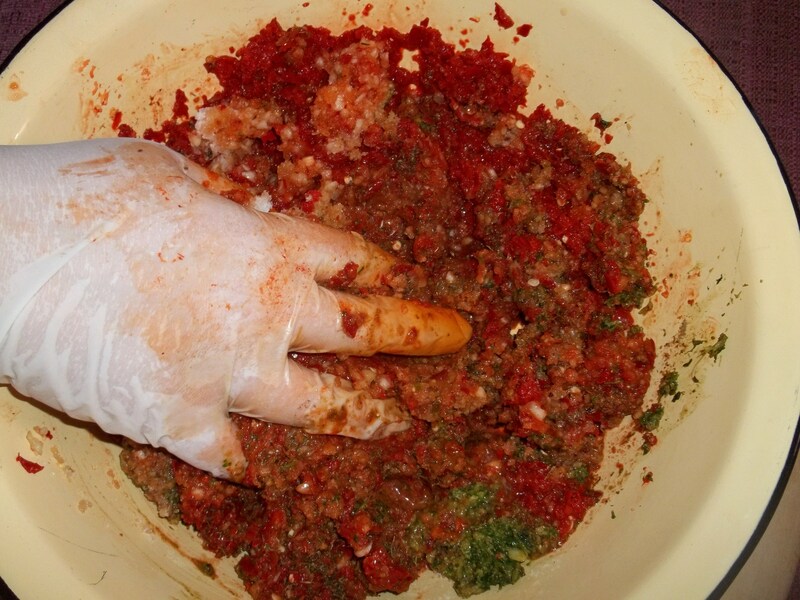 Use your hands to thoroughly mix the ajika. CAUTION: Wear gloves to do this or your fingers and hands will burn from the capsaicin (heat producing chemical) contained in the peppers. Add the white wine vinegar and the oil and mix thoroughly. Serving: Serve as a condiment with meat and fish dishes. It can also be used in cooking. I just returned from a trip that included a couple of days in St. Petersburg where I stayed at the Ambassador Hotel on Rimsky-Korsakov Ave. Just a few doors down from the hotel was a very small restaurant featuring Georgian cooking and a couple of my travel companions and I had dinner there one evening. The menu was very long and we tried to order a number of things … I had a spicy chicken stew with tomatoes and “walnut sauce”. I’ve been trying to discover a recipe to make something similar and I’m sure the adzhika was a major component of the dish I had. 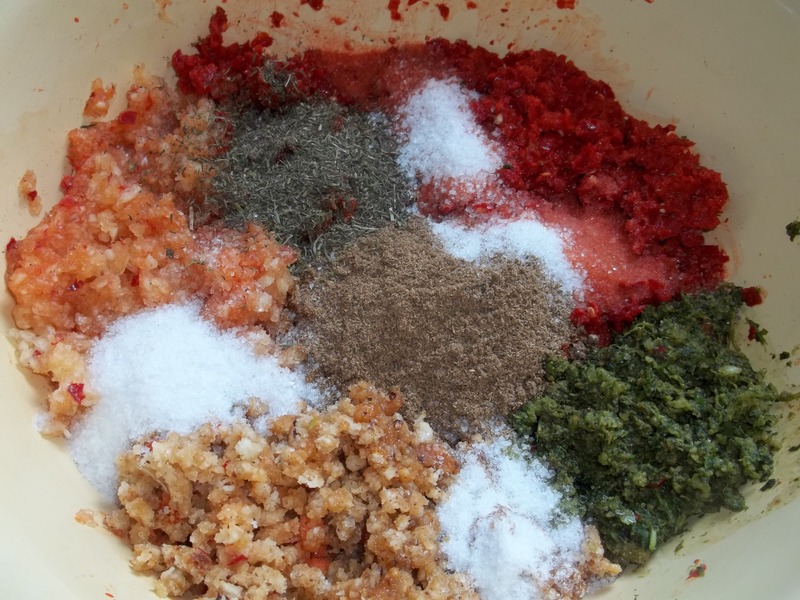 Thank you for the revised recipe – I can hardly wait to try it! I am pleased to hear that you enjoyed Georgian food and want to try some of the recipes. Enjoy!.